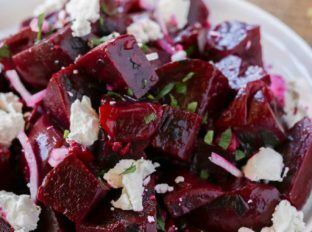 Roasted Beet Salad with Goat Cheese and a delicious yet easy lemon vinaigrette with sliced red onions and salty feta cheese. 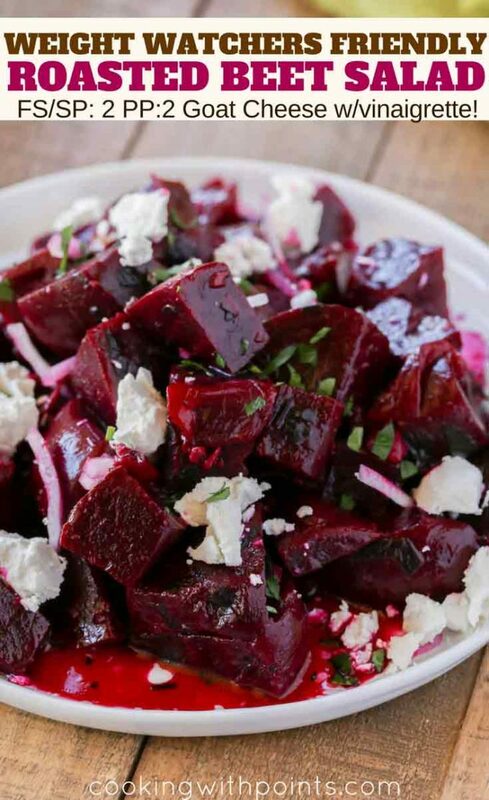 You’ll love this beet salad served alongside Lemon Greek Chicken Skewers or Lemon Dill Salmon. 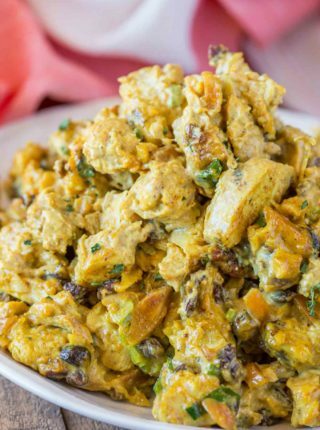 Such a fun and easy side dish with lots of flavor. One of the richest flavored vegetables I absolutely love are beets. A couple of months ago I went to a local olive oil farm here in Sacramento with a good friend of mine, Elise from Simply Recipes. We got a tour of the plant, got to watch them actually make olive oil and learned about the processes involved in producing high quality oils. Then we got to enjoy the best lunch I’ve had in as long as I can remember. The in house chef prepared an amazing roasted beet salad with pressed grilled feta that I actually dreamed about. In the absence of that amazing recipe I decided I’d create a fun and easy Roasted Beet Salad with Goat Cheese. Even with the olive oil, this is still just 2 points per serving. I actually counted the points for all of the olive oil but the beets will mostly not use it and we end up discarding the skin which absorbs some of it too. 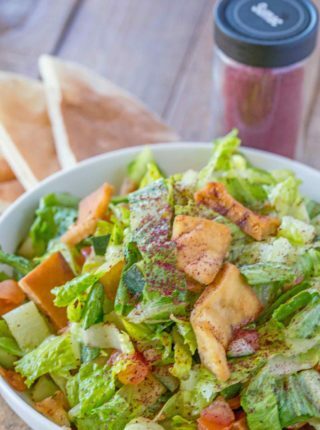 Either way, the delicious lemony olive oil dressing is so easy it hardly even qualifies as one. The roasted beets offer so much of the flavor that you don’t need to work too hard to dress them up. 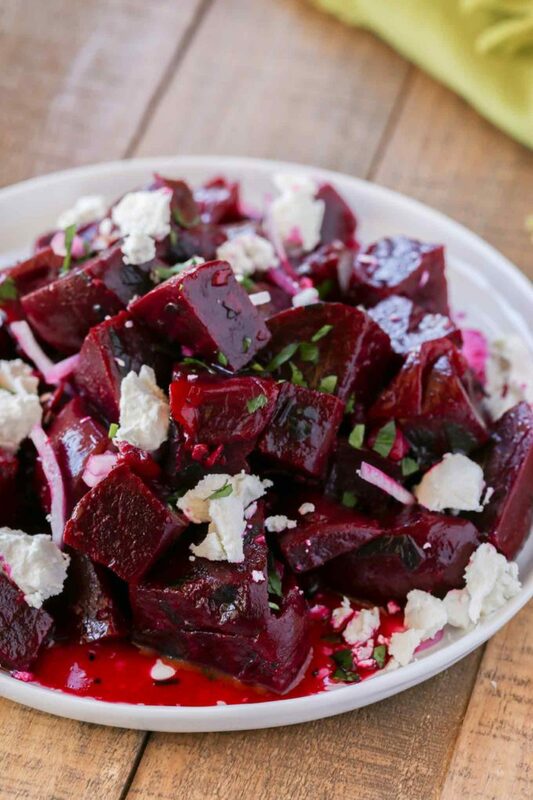 The crumbled goat cheese offers a briny and creamy counterpart to the super flavorful beets. We LOVE serving this with grilled chicken and roasted carrots and corn. Wrap beets in aluminum foil and add 1 teaspoon of olive oil to each packet. Place on a baking sheet, and roast in the oven until cooked through, approximately 60-65 minutes. Remove from the oven, let cool completely before peeling and serving. Wrap each beet loosely in foil. Add 1 1/2 tablespoons of olive oil to the beets (almost 1 teaspoon in each packet). Close the foil packet tightly to keep steam in. Let cool completely then use the back of a spoon to scrape off the skins. Cut into one inch cubes, then add the remaining tablespoon of olive oil, lemon juice, salt and pepper to the beets and toss gently. Add the onions and goat cheese and serve. I’m confused. Is this calculated with feta or goat cheese? Such amazing flavors without having any guilt! I love beets! 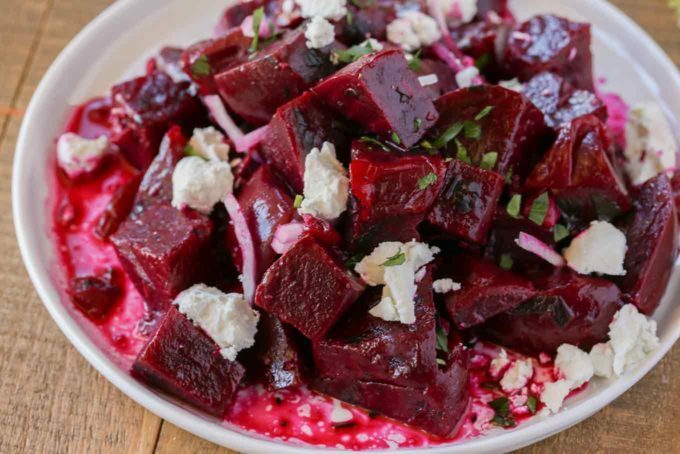 This beet salad looks like my kind of salad! This beet salad is a must make for my BBQ’s this Summer! I am so happy I found you! I went back to WW for the 100th time and I love to cook. This weekend I made 3 of your recipes ((Strawberry Poke Cake, Turkey Chili and Greek Chickpea Salad. YUM! So delicious! 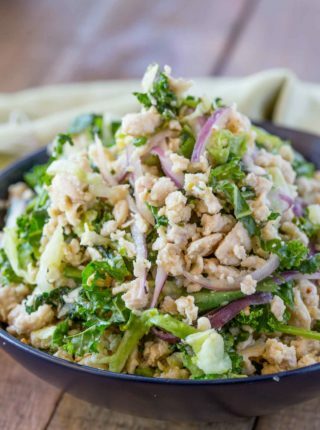 These recipes have made me feel as if I’m not really dieting. I’m adding this beet salad to next week’s shopping list. Thank you! Thanks so much, Amy! I’m always happy to hear when I’ve helped make someone’s WW journey more delicious! I haven’t had a beet in so long… which is crazy because I love them! Trying this soon! 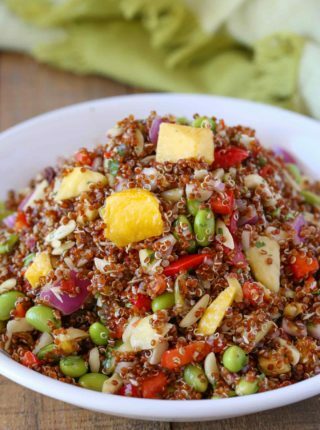 I love the dressing on this salad–so bright and fresh. I could use it on so many other dishes. I would love to try this! Such a gorgeous salad!